(MPI) - On September 24th, 2018, the Ministry of Planning and Investment held its first Online Conference for Assessing the Socio-Economic Development in 2018 and Formulating the Plan for Socio-Economic Development in 2019. Minister of Planning and Investment Nguyen Chi Dung chaired the Conference. Attending the conference at terminals were representatives of leaders of People's Committees of provinces and centrally–run cities, leaders of National Assembly Delegations, Planning and Investment Departments, Management Boards of Economic Zones, Industrial parks, Export processing zones, and Statistics Departments, etc. Minister Nguyen Chi Dung speaking at the opening of the Conference. the Ministry of Planning and Investment found that this method is no longer suitable for present day and proposed to innovate this method. Accordingly, the Ministry of Planning and Investment and local governments will make plans in each region. In 2018, the Ministry of Planning and Investment has held three Mid-term Review Conferences for assesement of the five-year plan period 2016-2020 and formulation of the plan for 2019 in three regions. Thereby, the overall picture of each locality were presented, local governments could exchange, learn experiences and grasp the situation in other localities to get an overall picture on socio-economic development of the whole country in general, as well as of each province, region. 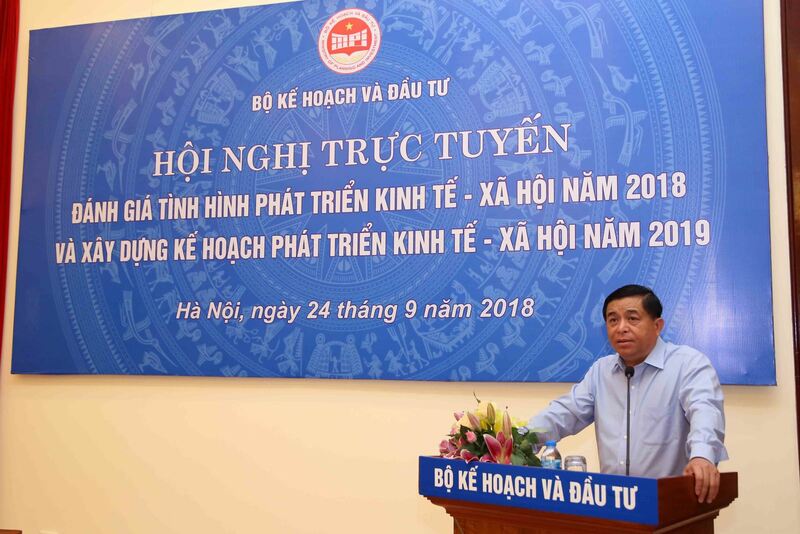 Minister Nguyen Chi Dung emphasized that 2018 is a hinge year, after half-way of implementing the national and local socio-economic development plans. This is the best and most important occasion to evaluate results after the halfway of implementing the assigned plans in the five-year plan; from that, identify the ability to complete tasks and present difficulties, obstacles as well as tasks to focus on in the last months of the year. This is also an occasion to exam, review remaining issues to achieve the highest results in implementing the 2018 plan and prepare for the formulation of the 2019 plan. Executing assigned tasks, the Ministry of Planning and Investment has drafted the Socio-Economic Report in 2018, preliminary evaluated the implementation as well as formulated scenarios and plans, tasks in 2019. The organization of the Online Conference with all provinces and cities will shorten the time, cost, with a large coverage, representatives will listen, exchange and grasp the situation to deploy the implementation. At the same time, it is suitable with the current general trend when we change to E-government and the digital economy. This affirms the continuously strong innovations of the Planning and Investment sector to deploy quickly, synchronously, uniformly and effectively the aimed tasks, Minister Nguyen Chi Dung emphasized. The Conference focused on discussing reports on socio-economic situation, investment, state budget of the country in general and of each sector, field and locality to serve the upcoming sessions of the Central Committee of the Communist Party, the National Assembly, the Party Committees, the People's Councils at all levels, the implementation of the localities’ socio-economic development plans, public investment issues aimed at in 2018 as well as tentative plans of the localities in 2019. In particular, the Conference discussed major issues that the Planning and Investment sector has while deploying, advising the institutional construction, deployment of the Law on Planning, Law on Supporting Small and Medium-size Enterprises. Along with that are the formulation, modification of the Law on Public Investment, Law on Amendment and supplement of a number of articles in the Law on Investment and Law on Enterprise, Law on PPP, the 30th Anniversary of Foreign Investment in Vietnam. Issues on improving the business environment, administrative reformation, PPP projects attraction as well as the development of enterprises, culture, society, environment, social security, poverty and hunger reduction, policy support, safety and social security insurance, corruption prevention and fight, complaints and denunciations settlements, etc. Ending the Conference, Minister Nguyen Chi Dung affirmed, although this is the first time the Conference organized in the online form, it has brought significance and efficiency. At the terminals, representatives of regions, different sizes of the economy, provinces with similar economic scale had participated in giving comments. The Conference focused on two main contents: to contribute comments to the Draft Report of the Ministry of Planning and Investment before submitting to the Government and the National Assembly; to discuss issues related to public investment. In general, the socio-economic situation in 2018 is assessed to equally develop in all fields, especially the manufacturing and processing industry has been developing well, the agricultural sector restructured effectively, tourism and services have some outstanding development steps. All 3 areas are moving in the right, positive direction. In the last time, we have paid much attention to the socio-cultural area, the guidelines and policies of the Party and the State have been being implemented well, policies for merit people, difficult areas, health care, education, science and technology have been focused on and achieved positive results, etc. The people's lives have been improving and being elevated. Thanks to the direction of the Party, the supervision of the National Assembly, the efforts of the political system, the companion of the people and enterprises, the results of 2018 was brought about, creating a premise to firmly implement the 2019 plan, as well as the five-year plan period 2016-2021. 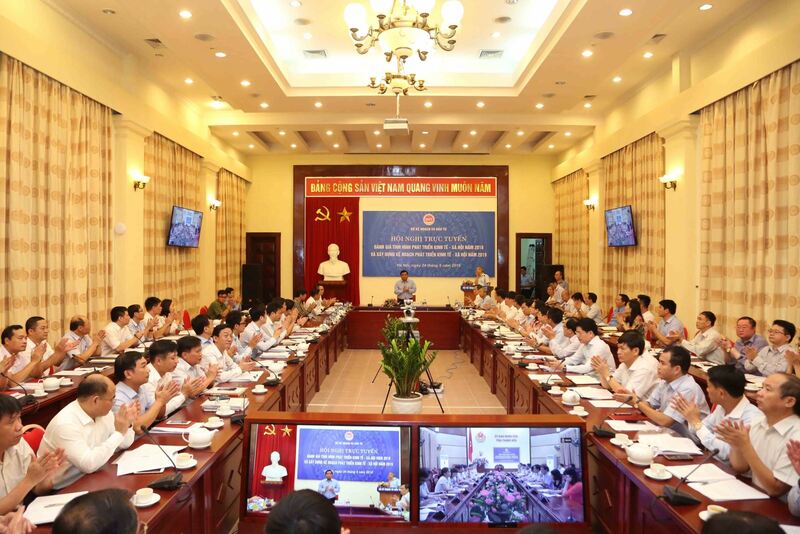 Minister Nguyen Chi Dung emphasized that the results of the completion of the 2018 plan associated with economic restructuring, implementation of 3 strategic breakthroughs, the transformation of the growth model in depth, concentration on enhancing productivity, efficiency and competitiveness of the economy through indexes are considered to have positive changes. Representatives agreed with solutions to implement the 2019 plan and believed that to ensure the completion of the five-year plan period 2016-2021, the growth of the whole country and the localities must be maintained, especially in the context of the world's impacts and our relatively small open economy. Therefore, it is necessary to identify the difficulties and challenges of the whole economy and each locality, to find opportunities and materialize them in accordance with each locality. In particular, we must take advantage of opportunities offered by the industrial revolution 4.0, so that we can accelerate, based on innovation, science and technology platform. This is also an issue that the Government is drastic directing. Minister Nguyen Chi Dung also clarified some issues on the Law on Public Investment, disbursement of public investment capital, some new points of Decree No. 120/2018/ND-CP. Regarding the institutional work, Minister Nguyen Chi Dung said that the Ministry of Planning and Investment is continuing to complete the draft of the Law on amending and supplementing the laws related to master planning which include 37 laws to submit to the National Assembly for approval at the 6th Session of the XIV National Assembly. At the same time, the Ministry is also completing to submit to the Government a Draft Decree detailing and guiding the implementation of a number of articles of the Law on Planning and drafting a Circular guiding the cost for planning activities to implement after the issuance of the Decree mentioned above. Along with that, in order to boost the implementation of the Law on Supporting SMEs, the Ministry organized a Conference to increase awareness of the implementation of this Law among ministries, branches, and localities, through that, speed up the progress and enhance the effectiveness of the Law implementation, timely responding to the practical demands of supporting the development of SMEs. Regarding the role of foreign investment after 30 years, Minister Nguyen Chi Dung said that the Party and the State affirmed that foreign investment is a part of Vietnam's economy, therefore we must continue to build a new orientation to fit with the new situation. In which the common issue of the whole country is to accelerate the implementation of three breakthroughs: institutional complement, infrastructure development, and good human resources preparation. Minister Nguyen Chi Dung emphasized that the localities must effectively implement master planning, identify investment projects as a premise to call for investment projects; at the same time, thoroughly prepare the site, infrastructure issues and human resources for the projects, change the investment promotion methods. Recently, we have organized many investment promotion conferences with many investment commitments, but if we do not commit to handle difficulties and facilitate favorable conditions for enterprises, it is difficult for these investment commitments to become reality, etc. Planning and Investment sector is a crucial general strategic advisory sector of the Party and the State, this has been confirmed through 73 years of establishment and development. The sector directly participates in the construction of institution, building and allocation of resources. However, we are facing a new situation, which requires strong reforms. The Ministry of Planning and Investment has bravely decentralized and authorized the local governments. At the Conference, Minister Nguyen Chi Dung suggested that leaders of local governments continue to facilitate conditions for the Planning and Investment sector to promote the advising role for provincial Party Committee, People's Council, People's Committee at all levels to make the best contribution to localities in socio-economic development. Especially, Planning and Investment Departments of localities must actively innovate, reform in line with the spirit of the Ministry of Planning and Investment to reach new heights, promote the role assigned by the Party, the State and local governments./.